Did I ever mention about how much I just love the light at sunrise? Chelbie and I had just finished shooting on the beach with the rising sun over the ocean as her background and we were driving back in to civilization to grab some MUCH needed coffee..when we spotted this old boat dock jutting out into the marsh. The light was incredible, so I asked if she could just jump out and run to the end of the dock and turn around. This was the first exposure I took, she didin’t even want to put her shoes on. She is a true girl from the country and wanted to be as natural as possible in some of her images. For everyone who believes they need all this expensive gear (now I know for some imagery, there are many items I could use to really bring a different look and feel to this image), but, i really like this capture. The only equipment I used (or just grabbed while I chased after her! lolol) was my Nikon camera nd my lens (thank goodness I still had my trusty 70-200 2.8 VR attached to the camera) I photographed this back in the summer, and I am SO looking forward to warmer weather soon. Hope the sunrise today brings joy and happiness to you. Equipment used: Nikon D700, Nikkor 24-27 2.8 lens, Induro CT213 tripod, Induro BHD2 ballhead. The peaceful and easy feeling projected by this wonderful location in Folly Beach, SC just kept me shooting for nearly an hour. I am standing on a low bridge (yes, on a walkway), even some of the passing cars stopped to take in the beautiful scene. One or two more images from this series coming soon. Thanks so much for your visits and comments! Equipment used: Nikon D700, Nikkor 24-70 2.8 lens, full ND filter, Induro CT213 tripod, Induro BHD2 ballhead. Equipment used: Nikon D700, Nikkor 24-70 2.8 lens, AB400 x 2 via octabox (L) and umbrella fill light, remote wireless triggers (Pocket Wizard). 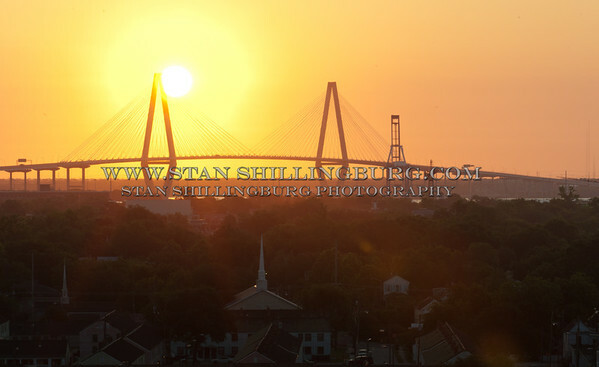 One of the great Icons of Charleston, SC is the Arthur Ravenel Jr. Bridge. 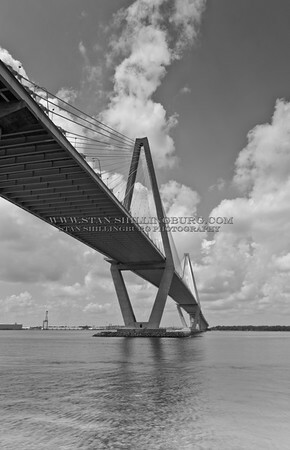 Under this bridge is Waterfront Park, and it does have some wonderful photo ops. This shot is just another of my attempts to fine tune my eye for some true fine art imagery, many thanks for your visits and comments! Assignment: Here we are at the park, find a subject and compose your shot. Equipment used: Nikon D700, Nikkor 24-70 2.8 lens, full ND filter, Induro CT213 tripod, and an Induro BHD2 ballhead. Hi everyone, I have been recieving several emails wanting to see one of my images “raw, right off the camera”. Well, here you are. I chose this one because it demonstrates brutal lighting, metering, and exposure challenges. Camera Settings: f/22 @ 1/15sec, 175mm focal length, ISO 100, no flash fired.